Home-baked coffee cake! Yes, it takes longer to bake your own danish coffee cake than it does to run to the store to buy one, but not surprisingly, the homemade version is much more delicious! And thanks to Michele, I went the homemade route this weekend and made two versions: almond and cheese. Michele and I both baked this over the weekend, so be sure to go to her blog to see her post (spoiler: she liked it!). Thank you Michele for the awesome idea to make this! My husband and I really enjoyed these. The inside is tender and the outside is delicately crisp. He slightly favored the almond and I slightly favored the cheese, but we both liked both flavors a lot. Shortly after baking, I delivered half of each coffee cake to my parents, and hopefully they enjoyed this as much as we did! While this isn’t a beginner recipe, I didn’t think it was particularly difficult; however, planning and patience are helpful. To make the danish dough, you mix the dough and then incorporate the butter through a series of rolling and folding, with breaks for chilling along the way. This process creates layers of butter and dough, resulting in a tender, layered pastry. This method is similar to croissants, which I’ll be making sometime soon, and puff pastry, which I’ve been meaning to make forever. Call me a baking nerd, but this was an exciting accomplishment for me! I made puff pastry in a class, but this was the first time doing something like this on my own, and it was fun to see it all come together in the finished product. I made 1/2 recipe of the danish dough, which makes two coffee cakes. I baked both, but the recipe gives instructions for freezing an unbaked coffee cake if you want to save one for later. I made the danish dough one day and shaped, filled, proofed, and baked the next day. If you are going to leave the dough in the refrigerator overnight, wrap it loosely in plastic: since there is yeast in the dough, it needs a little room to expand. The recipe gives two options for spreading the butter on the dough: you can use your fingers or you can roll the butter between sheets of plastic. I used my fingers but I had a hard time with that, so next time I’ll try rolling it. The photos in the book show how to create the braid. I filled one coffee cake with the cheese filling recipe from the book. I filled the other coffee cake with Dorie Greenspan’s almond cream, which I made when I made her French Pear Tart. A lot of the almond cream leaked out a lot when the coffee cake was baking, so I’m not sure this was the best choice but it tasted great. Next time I’ll try the almond filling recipe from the book. If you have a copy of The Art and Soul of Baking, look on page 121. If you don’t have the book, you can find the recipe here on Google Books. As you’ll see, the recipe for the Braided Danish Coffee Cake refers you to the recipes for the danish dough and fillings; all are available in Google Books, so just scroll through to find the pages with the other recipes. Take a look at the other recipes that you can make with the danish dough – they all look delicious! I don’t have the book, but I’ve heard many good things about it, and after making this recipe, it’s going on my cookbook wish list. I really like how the instructions are written; they’re easy to follow and I am 100% satisfied with the results. Jill, that looks amazing! 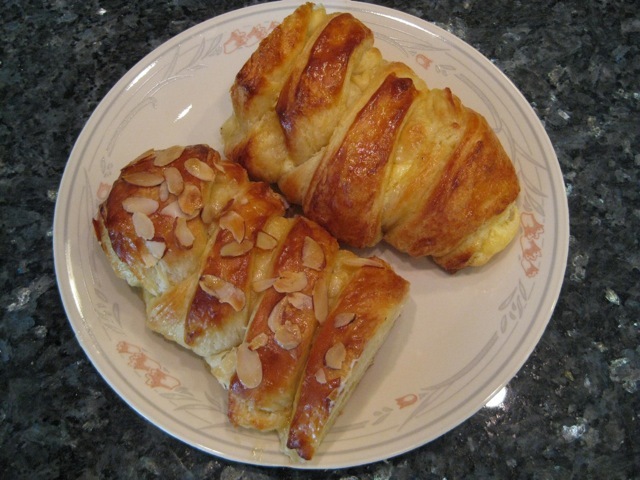 I am a huge fan of almond pastries, I’m sure it was divine. I got myself The Art and Soul of Baking for Christmas (it was $20 at Costco, couldn’t resist) and have really been enjoying reading through it – tons of great information. Your coffecake is amazing Jill!! Thanks for baking with me. I’m not sure if I would have attempted this on my own! WOW. I’ve never attempted pastry, much less a braided one. These are absolutely amazing! They look stunning and SO delicious! I love anything with cardamom. Beautiful braid. Wow, what gorgeous Danish, Jill. You and Michele are definitely rock star bakers. Yours look better than some at the CIA! WOW! These look amazing. I’m sure they were delish. I love Danish coffee cakes – and these look scrumptious! Made one like this for Daring Bakers. Lots of work but soooo yummy!! Yours is beautiful. Wow…. very impressed Jill. Yes, I have that book, but need to go through it yet again! I’ve made puff pastry before… THAT was a day long event – so I’m quite smitten with your creation -it looks wonderful!!! You’re quite talented! That looks so fantastic! I encourage you to make the cocoa-nana bread too, it’s really good, and add the cardamom. Oh, why could this not have the recipe for this week instead of the chocolate bread??? OMW this looks delicious, you did a particularly fine job of making it look so, too. YUM. Any left? I just might have to try this very very soon. This looks (and probably is) completely and totaly divine! WOW! This looks so, SO good! I’m really intimidated by coffee cakes like these but your photos almost give me the confidence to try. I must be the last person to hear about Google books. What a good resource. Your Danish pastry looks divine! I’m so jealous of your accomplishment. Well done! That looks really good. Really. I’ve only used Martha Stewart’s recipe for danish dough and it’s never failed me. Of course, now I simply MUST try the one you did, it looks incredible. I am so jealous of all the great things you and Michelle have been making! Wow, look at you! Making laminated dough at home is intense, and your danish loaves look amazing. Awesome! wow wow wow…those look professionally done! 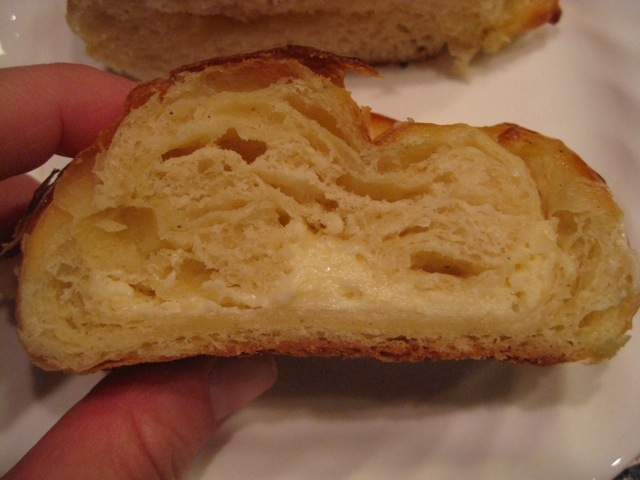 yum…i can just taste the flaky layers. looks delicious! Wonderful Danish pastries! I have “The Art and Soul of Baking” so will do some good reading. I would love to get the better of this dough – made it once and it was not too much of a success. Those danish look fabulous! I will have to check out Google books. Thanks for the info! Gorgeous Danish Braid and it’s one of my favorite things to make. I love laminating dough and recently laminated pizza dough and it made the most incredible crust ever! The Art and Soul of Baking is a wonderful book – everything I have tried from it has turned out beautifully. Holy Cow, these danishes look totally advanced for a baker! They look absolutely stunning! I love danishes but it would NEVER occur to me to bake them myself. Yeesh. You did a beautiful job baking danishes for your first time. Beautiful! Oh my. Those are exactly the two flavors I would have picked. They look fantastic!